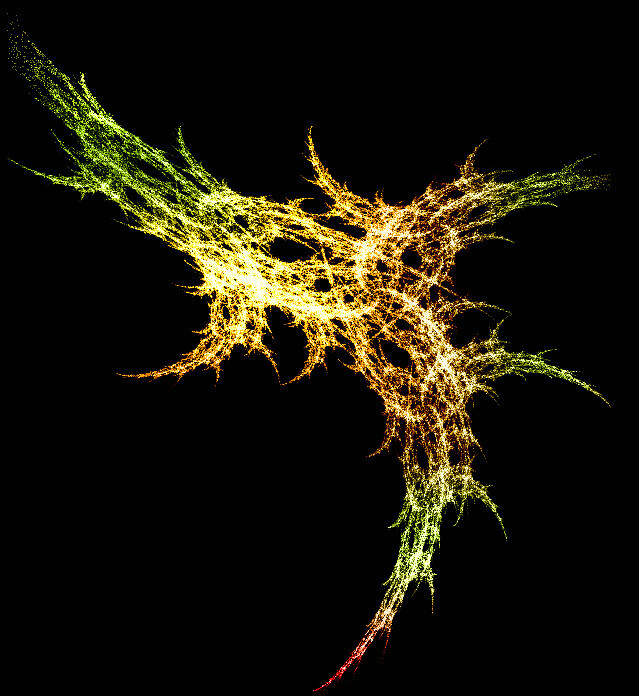 Above is an iterated function system fractal generated from two affine transformation of the plane and Barnsley’s chaos game. This image represents the first proper artistic collaboration between myself and my wife. Hopefully more will follow. I was struck by how from a rather random method one produces such regular patterns via IFS’s. Many of them look rather organic, I’ll post more in the future as we improve our methods. I would like to learn more about iterated analysis, if you would indulge my total ignorance of your subject. It looks to me to be a visualization tool useful for studying anisotropic turbulence. Suppose the organization happens by a directed input of energy in a forcing regime. Do you see an application in CFD for the analysis of symmetry-breaking in antidissipative fluid behavior, like tornado touchdowns? A heuristic image? I am really not an expert in this. One can create images that closely resemble many things found in nature using IFS’s. I don’t know if you can use this to really model the systems you wish to study. Very good – it looks as if it is a two dimensional representation of a three dimensional shape.